We registered at honeyfund where our wedding guests could gift us experiences and money for our trip instead of material items. Jon and I have lived together for over 3 years now and have collected everything we needed in that time, so we were fortunate enough to be able to experience this incredible vacation instead of getting a mixer! If you’re looking for something untraditional as far as wedding registries go, this is a great option! But, lets get to it! Our journey started in the Toronto airport about 3 hours prior to our boarding time, because I’m a little neurotic when it comes to flying. We are lucky to live close to Toronto Pearson where we can hope on a direct flight. I’m a bad flyer - so the less I have to go up and down the better. Plus, who wants to spend time running around airports on vacation? When we arrived in Rome we took the express train into the city. This cost about 35/euro a person and takes about 35 minutes. We discovered on the way back that a cab is only 40 euro from city center to airport, so we grabbed one on the way back to save time and money. It was a little bit of a hassle to find our first AirBNB, but once we checked-in and chilled out the fun began. We were staying in a really great location on the west side of the city just far enough from the crowds and monuments, tucked away with a lot of local alleys and shops. I couldn’t believe the first stroll we took around the neighborhood. 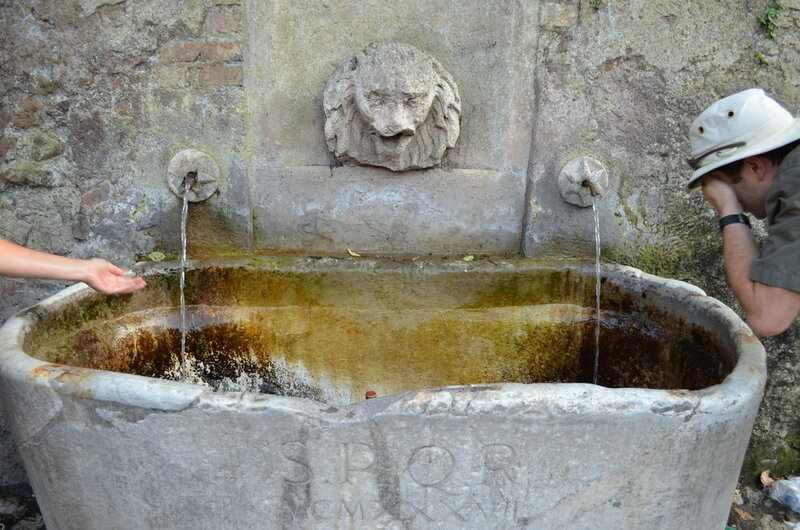 All of the streets were cobbled, clothes draped and blowing in the breeze across alley ways, old men sitting on benches sipping espresso, marble monuments big and small at every turn. It really lived up to my expectations. We stopped at a small cafe for our first meal. We were starving, and we wanted to immediately jump into the goods. A quick bite after we landed. You know it's good when there is meat hanging from the ceiling. We shared a meat and cheese board (only 8 euro - c’mon! ), a bottle of wine, and sat on little crates in the back of this cafe. I was a little disoriented with all the menus being in Italian (I figured most of it out by the end of our trip) so I asked the guys to just make me what they liked. What a great decision! The whole meal cost us 15 euro and we had some of the best casual food of our lives. All of the cobblestone was magnificant! Jon booked us a free bike tour the same day we arrived so we could get a lay of the land. The bike tour way great, done by a local who just loves to ride bikes and knows the secret spots of the city. We got a little history tour along the way, he showed us all the neighborhoods, told us what tourist traps to avoid, and took us to a great place to watch the sunset. The whole thing only cost the price of the bike rental - which was 10 euro. We then kept the bikes two more days! We did tip him 20 euro each, and it was totally worth it! a slice of modern in an ancient oasis. We love renting bikes to see any new city. Its way quicker than walking, you don’t have to mess around with public transit, and it’s low impact. You can ride bikes all day and feel a lot less tired than walking everywhere. Generally, Rome was a pretty bike friendly city. We stayed on back roads and alleys about 90% of the time. Saw this church on our bike tour. It was beautiful, but eery. The nuns were singing a low tune the entire time which echoed through out. I feel like we almost witnessed an end of an era here. The churches were bare, there were only a few nuns left all in the late years of their lives. Our last stop on the bike tour where we watched the sunset. It just so happens that two of our close friends were in Rome the same time we were. Honeymoon crashers! We met them for dinner twice and it was really great to spend time with them and catch up. We spent the days riding our bikes around, seeing the sights, and eating and drinking. The highlight of my trip was being able to see everything in real life that I’ve only seen in text books or online. I have a degree in Fine Arts, so I spent the majority of my college years taking art history, history of architecture, sculpture, textiles, etc. I have such an appreciation for the craft that when we were walking through the Capitoline in Rome, I was actually silently sobbing. That was by far the best museum we went to. The views from the museum were some of the most beautiful we saw of the city. The second part of the museum overlooked the Forum, and the building itself was just magnificent. Me, weeping after seeing and touching everything. A metal sculpture found perfectly intact when they started to dig for the museums renovation/addition. Imageine being given a cube of marble and a chisel and creating this. Look at the veining in the arm! An incredible study. My advice would be to go see all the monuments at nighttime, when it’s cooler and there are a lot less people. They are just as magnificent at nighttime, and so much more enjoyable when you aren’t being hit in the face with selfie sticks left and right. Pedestrians just straight up walk across the street and cars stop. No lights, no signs. Fueling up outside a cafe. We usually drink double shots at home, we found that in Italy it was hit or miss with ordering a double shot. Sometimes it was correct, sometimes we ended up with 4 shots of espresso. Whoops! A refillable water bottle is a must. It saved us many times on our bike rides and walks. It was about 95 degrees everyday, and at peak sun we felt it! Yay aquaducts! 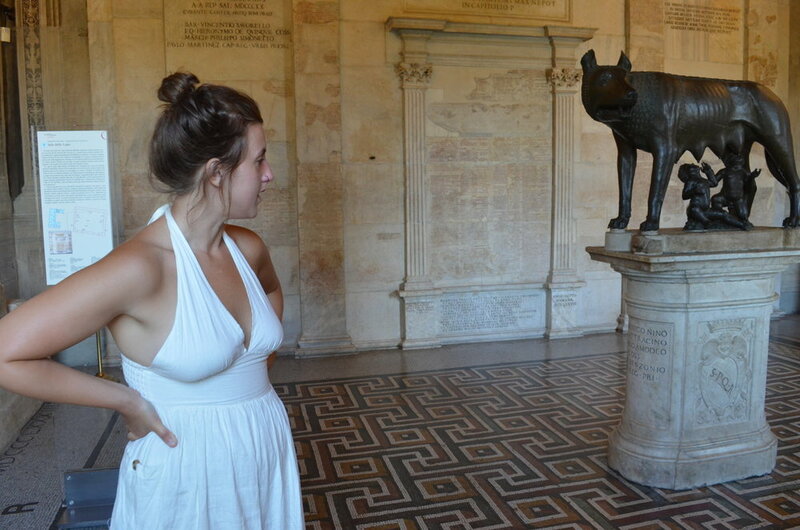 Looking back, Rome was my favorite city that we visited. Its so full of culture, history, and art that it makes it hard to beat. I loved that there were different neighborhoods each with a different vibe, the mass amounts of marble at every step. Just being able to walk aimlessly and see things that have been there for over 2000 years is mind blowing. I will definitely be back to spend more time there.